How in the world could anyone not convert? Heck, this landing page is probably going to score a 100% conversion rate ... maybe higher! I hate to break it to you, but as kickass awesome as your landing page probably is, there might be some psychological triggers turning your customers away. Instead of loving your landing page, they’re going to loathe it. Instead of converting, they’re going to curse it. The problem comes when you’ve set off some psychological trigger. These aren’t obvious issues. They are subtle, but nonetheless real. Based on my research, I’ve compiled the four most common psychological triggers on landing pages. These are the mistakes that could cost you several percentage points on your conversion rate. The goal of a landing page is single, focused, powerful and unstoppable. It’s all about conversions. Do your landing pages have these negative psychological triggers? 1. Featuring a bland CTA. The call to action is the single most important element on your landing page. Don’t blow it with a psychological no-brainer. Here, the psychological trigger is actually a non-trigger. Let me explain. The CTA is your final effort to create that psychological sizzle that will push them over the edge and into conversion land. Who in the wide world is going get a tingle of psychological scintillation from a word like "submit"? Reader Be Warned: Bar graphs ahead. Want a whole panoply of face-palming stupid CTAs? They’ve been tested. So what do you do to get an awesome CTA? I’ve assembled a few of my favorites below. Use them as inspiration, or you can flat-out steal them and try not to feel guilty when your conversion rates clock in at around 50% of so. Note: I have no affiliation with Hubspot. You can worry all you want about button size, button placement, button color, and all the other cool stuff. But if you go all boring with your CTA text, you may have crossed the psychological line of naughtiness. Testimonials are awesome. But if you overuse testimonials, you could set off a psychological trigger. Why? When people read a testimonial, they’ve got their guard up. They want to find out whether you’re a snake oil salesman with “true” miracle stories, or if you’re legitimate, high-quality and worthy of trust. This is an actual screenshot I took as I was researching this article today. Stuff Your Inbox With Genuine Testimonials! No Hassle - No Hype. The whole process is handled by the Bot and all you have to do is to open your inbox regularly to read and select the testimonials that are coming! Testimonials Generator is simple to use:No Server Set Up Required No Head Aches No HTML Experience Necessary Simple to use User Interface Unlimited Testimonials Bots Flexible Testimonials Forms Everything is done for you automatically in Testimonials Generator. You see why people might be skeptical? Here are testimonials from a landing page that you can trust. Why? They have pictures. They have cachet. They have actual companies that you can Google and find out about. And Tim Ferriss? Yes, please. This one is good, too. Why? Picture. (Very big picture.) Name, position and linked website. Killer. Here’s an example of a landing page with an abysmally scammy-looking testimonial. Problems? Generic names. Stock photos, and the marketing intern wrote the testimonials himself on Friday afternoon when he wanted to leave work to hit the bar in time for Friday Happy Hour. And sometimes, people forget to remove dummy text. Whoops. Any takers on BidShack? Not after getting psychologically freaked out with these non-testimonial testimonials. Do you recognize “John,” or “Joe,” or “Tom?” Yeah, that guy. He’s done a testimonial for erectile dysfunction pills, scanners, and an iPhone app. Right. Use this image, and you’re toast. Testimonials can either make or break your landing page. If you overdo it, you will trip a psychological wire and ruin the conversion. It’s just that simple. According to implications of the signaling theory, guarantees are signs of trust and trustworthiness. However, regardless of the shifting vantages and perceptions of the guarantee, one thing remains true — consumers expect guarantees. It logically follows, then, that the lack of a guarantee may be a negative psychological trigger. If e-commerce guarantees are part of the consumer’s expectation, but your landing page makes no mention of that guarantee, then the consumer has a psychological experience of distrust. Neil Patel tested guarantees vs. no guarantees (free trial), and discovered that through a 30-day satisfaction guarantee, he was able to improve his revenue. Even though he ended up giving some people their money back, he actually improved his overall revenue. Free trial with credit card upfront combined with a money-back guarantee offer: $24,428 a month in revenue. Can you afford to offer a guarantee? If Patel’s statistics are any indication of what could be true, then maybe you can’t afford not to. Offering guarantees poses a problem, however, for many landing pages. In order to be truly legitimate, a “guarantee” is a legal and financial contractual agreement between purchaser and merchant. Wouldn’t it jeopardize the conversion process to provide an outbound link to your guarantee legal page? Yes, it could. However, just the word guarantee is a selling word. In Buffer’s landmark article, “The Big List of 189 Words That Convert,” the word “guarantee” was listed as one of “28 words and phrases that make you feel safe.” Just the word itself is a psychological signal that can introduce positivity rather than negativity toward a transaction. If you don’t want to risk having your customers bounce off your landing page to another page, just state your guarantee directly on the page. Strip away the legalese, and say exactly what your guarantee is. Use guarantee symbols and seals for bonus points. Below are the 10 most commonly used types of guarantees. You can find one that works for you, regardless of your product or service. Here’s a nice guarantee sample from Rockable Press. Image from The Landing Page Course. Remember, you can use the guarantee without even saying “guarantee.” There are subtle ways to word it, that help you avoid the psychological scare of “this is risky.” How do you do it? Tell them it’s not risky. Here’s how Moz did it in an earlier version of their landing page (when they were still SEOMoz). However you choose to go about it, don’t set off the psychological trigger of a no-guarantee. It’s just too dangerous. People can’t handle life on the edge like that. Humans are suckers for "free." Free anything. I’ll bet if you offered “free air plus shipping and handling!” people would pay you for it. Marketers, copywriters, neuroscientists, and hucksters have all figured out that people fall for "free." And just maybe it can be taken too far. 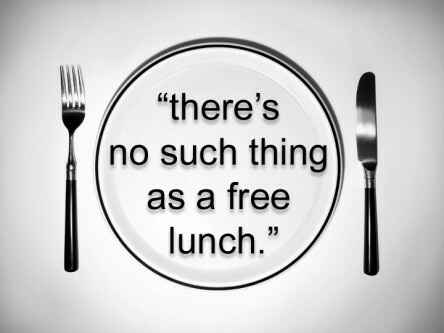 Along with the appeal of the word (and reality of) free, we’re also trained to be skeptical of “free.” Have you ever heard “there ain't no such thing as a free lunch” (TANSTAAFL)? Apart from the pardonable use of the double negative, this expression is true, even in the digital era. When you start slinging around the word “free” with reckless abandon, you’re going to cross the threshold of someone’s psychological hen house. If it’s too good to be true, it probably is. It’s like snake oil. And you are like the seller. But if you overuse the free card, you run the risk of being gimmicky. A customer, by definition, is a buyer. He or she is prepared to spend. If you hook them with free, then give them free. But don’t shy away from charging for legitimate high-quality goods or services. And don’t overuse “free.” We as Internet shoppers are a skeptical lot. We Google your product and “scam.” We read fine print. We know a scam when we see it. And if you ever do something like this, I may actually punch an actual hole in my laptop. Let’s go back to that squeaky clean and really-quite-awesome landing page that I mentioned at the beginning of this article. Do you have real testimonials or stock-photos-of-those-people-that-everyone-recognizes-because-they’re-on-almost-every-single-other-scammer’s-website? Do you have a real guarantee, or a scary drop into the abyss of e-commerce? Now, if you make the necessary corrections, your landing page will really start to nail. Your conversions might not go over 100% but, hey, there’s a first time for everything.